The Ola Home Theatre Cabinet 8137 features rounded gray-tinted glass doors that give the illusion they wrap around the sides. 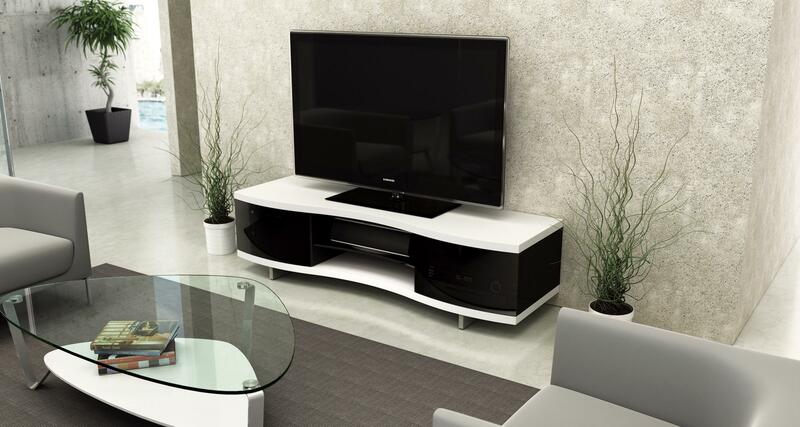 The open compartment conceals an adjustable center shelf that conveniently holds any and all of your media gadgets. The well-designed cable management system at the rear is accompanied by an easily removed back panel to access everything. Arena 9972 TV Mount Compatible. Maximum TV Size: 75 inches. Top Shelf Capacity: 150 pounds. BDI’s middle name is Design, and honorably so. Becker Designed, Inc. has decades of experience in making long-lasting and timeless office and home theater furniture. The first of its kind, BDI successfully merges innovation with design by applying the principles of high-end modern and contemporary design to practical, everyday furniture use for the modern-minded.